KENNESAW, GA - Cohesive Solutions announces a new e-business solution. 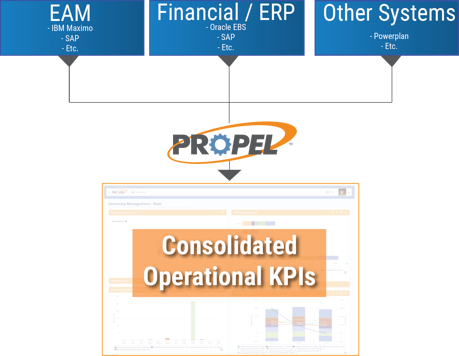 Propel, a Performance Management solution, now offers innovative solutions for measuring operational performance leveraging Oracle E-Business Suite (EBS). In conjunction with IBM Maximo or any other Enterprise Asset Management system, Propel now broadens the ecosystem of key business processes under measurement for organizations seeking to continuously improve their operations. Propel offers a rapidly deployable pre-engineered data model and standardized performance measures for organizations dependent upon Asset Lifecycle Management, Maintenance and Reliability, Materials Management, Supply Chain, HR, and Environmental, Health and Safety (EHS). Using Propel, organizations can ensure that operational processes maintain alignment with their underlying business objectives. Propel federates data from multiple sources, such as Oracle EBS or any business system, providing centralized aligned Key Performance Indicators (KPIs). Individuals and teams responsible for performance can define and manage continuous improvement initiatives while Propel's automation capabilities monitor business conditions in the background. It is the only seamless solution available for those applying organizational management strategies, such as Lean Six Sigma, to improve their business. Cohesive Solutions, Inc., is a leading enterprise asset management consultant, certified Premier IBM Business Partner and systems integrator. Cohesive Solutions provides business transformation and consulting services that enable organizations to achieve higher asset ROI. Cohesive Solutions also delivers a unique EPM solution, Propel, that unlocks hidden potential while aligning business performance goals. Since 1998 Cohesive Solutions has provided world class services to North American organizations. This press release was originally posted on PR Web, click here to view it.